The Eagle award is the highest advancement rank that can be earned as a Boy Scouts of America troop member. It requires years of dedication and work to meet the requirements including progressing through six previous rank advancements, earning 21 merit badges, serving in a troop leadership position, performing a community service project, participating in a Scoutmaster conference, and successfully completing an Eagle Scout board of review. Only seven percent of all Boy Scouts achieved this rank in 2013. 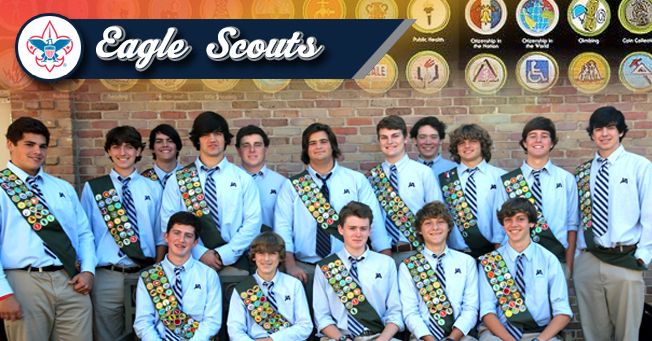 These Jackson Academy students have all received the Eagle Scout ranking. Among their projects were a coat drive for City Church, improvements at Catholic Charities, new campsites at LeFleur’s Bluff State Park, benches for Anne Smith Elementary, a concession stand and tables for Little Light House, landscaping at Mission First, grounds cleaning and storage organization at Matt’s House, support to Magnolia Speech School, and a map including a complete record book of graves for Madison UMC. If you have not already submitted this information and your son has received the Eagle rank or daughter has received the Gold Award for Girl Scouts, please let us know for future recognition at news@jacksonacademy.org.